Natasha Despotovic, Festival Director, thanked the supporters of the event and announced that preparations for 2007 are already underway. 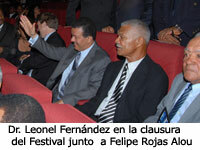 Felipe Rojas Alou, Osvaldo Vigil, Jesús Rojas Alou, and Manuel Mota participated in the closing ceremonies of the first annual Dominican Global Film Festival. Their stories, along with those of other Dominican pioneers in Major League baseball in the United States, were the basis of the film "La República del Béisbol" ("The Baseball Republic"). The documentary was shown this Sunday at the Manuel del Cabral Auditorium at the Universidad Autónoma de Santo Domingo (UASD) as part of the closing ceremonies of the Festival, which was organized by the Fundación Global Democracia y Desarrollo (FUNGLODE) and its sister institution in the United States, the Global Foundation for Democracy and Development /GFDD). Before the showing of the documentary directed by Daniel Manatt, President Leonel Fernández presided over an official closing ceremony for the Festival. Starting at 8:15PM, Master of Ceremonies Omar Liriano introduced a short video highlighting key moments of the event. Natasha Despotovic then gave the Festival’s closing words. "For 5 days, we have shown the best of international contemporary film, both dramatic and documentary. An audience of almost 10,000 has viewed 18 extraordinary movies and almost 300 Dominican students and professionals have benefited from the Festival’s panels and workshops", said Despotovic. "We have been hosts to more than 60 professionals from around the globe, including actors, directors, producers, and high-level executives in the film industry. The question and answer sessions that accompanied the showings of the films illustrated from a great desire to learn on the part of the audience and often turned into gatherings among friends. The panels and workshops for Dominican students and professionals of film served as a basis for improved collaboration, and, at the same time, allowed us to establish valuable connections with institutions and professionals outside the Dominican Republic". After sharing that the content of the panels and workshops is available online on the Festival’s webpage l (www.drglobalfilmfestival.org) and affirming that the first annual Dominican Global Film Festival had been a great success and an important even for both the country and the region, Despotovic emphasized that work is already in progress on the next edition of the Festival to be held in 2007. She ended by thanking the audience for their support and recognizing the hard work and contributions of all FUNGLODE/GFDD’s partner institutions. Finally, she introduced Dan Manatt, director and producer of "La República del béisbol", inviting him to present his documentary film. Manatt took the stage, asking that the "La República del Béisbol" production team members present in the audience join him for this emotional moment. The North American director then requested that Osvaldo Vigil, Felipe Rojas Alou, Jesús Rojas Alou, and Manuel Mota also join him onstage, to which the audience responded with a standing ovation. After the ceremony and with a shout of "Play ball!" from Dan Manatt, the lights were dimmed and the documentary began. After the viewing, guests moved to the lobby of the UASD library for a closing cocktail. The night ended with a starry sky illuminated by fireworks in celebration of the success of the Festival.